The next fundamental technique in handling people lesson Dale Carnegie teaches in How to Win Friends and Influence People is that you should arouse in the other person an eager want. As you read this you’ll probably be able to think of a friend or two that do this … and think of Tom Sawyer and the painting of the fence. “Andrew Carnegie, the poverty – stricken Scotch lad who started to work at two cents an hour and finally gave away $365 million, learned early in life that the only way to influence people is to talk in terms of what the other person wants. He attended school only four years; yet he learned how to handle people. “To illustrate: His sister – in – law was worried sick over her two boys. They were at Yale, and they were so busy with their own affairs that they neglected to write home and paid no attention whatever to their mother’s frantic letters.” Remember this book was published in the 1930s. “Then Carnegie offered to wager a hundred dollars that he could get an answer by return mail, without even asking for it. Someone called his bet; so he wrote his nephews a chatty letter, mentioning casually in a postscript that he was sending each one a five – dollar bill. “He neglected, however, to enclose the money. “Back came replies by return mail thanking ‘Dear Uncle Andrew’ for his kind note and – you can finish the sentence yourself. “Another example of persuading comes from Stan Novak …. Stan came home from work one evening to find his youngest son, Tim, kicking and screaming on the living room floor. He was to start kindergarten the next day and was protesting that he would not go. Stan sat down and thought, ‘If I were Tim, why would I be excited about going to kindergarten?’ He and his wife made a list of all the fun things Tim would do such as finger painting, singing songs, making new friends. Then they put them into action. “’We all started finger painting on the kitchen table – my wife, my other son, and myself, all having fun. Soon Tim was peeping around the corner. Next, he was begging to participate. “’Oh, no! You have to go to kindergarten first to learn how to finger – paint.’ With all the enthusiasm I could muster I went through the list talking in terms he could understand – telling him all the fun he would have in kindergarten. “If salespeople can show us how their services or merchandise will help us solve our problems, they won’t need to sell us. We’ll buy. And customers like to feel that they are buying – not being sold. There is a Main Street Lunch and Learn on May 31 at the Guymon Fire Department classroom. Brayden Lehew is going to teach everyone how to do a CAHOOTS quiz, which can be a great help in livening up a small audience and getting them to pay attention to your presentations. It will take place from noon to 1 pm and if you want lunch, bring a brown bag! 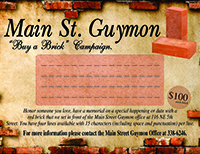 For more information, call Melyn Johnson at 338-6246 or email Director@MainStreetGuymon.com. See you there! How was that for enthusiasm? Catch you on the bricks.